Welcome to a same-height party. Where the playing field of absurdity is levelled, and everybody can look equally ridiculous. Soon to be an same-IQ party as well, by the look of the beverages being consumed. Personally, I think I would prefer to remain self-conscious and short, than be self-conscious and short on style. I think we would call these people ‘cloggies’ over here, mentally as well as physically! The Look Sneaker-head heaven the walls are even decked out in autographed hip-hop photos. LOL, men with short man syndrome are not very attractive! This would be very difficult after a few glasses of wine!!! I’m pretty short but one year for Halloween I made these awesome 9 inch demon hooves out of platform stripper boots. They were rad but I could only wear them about 15 minutes at a time because they hurt like hell. 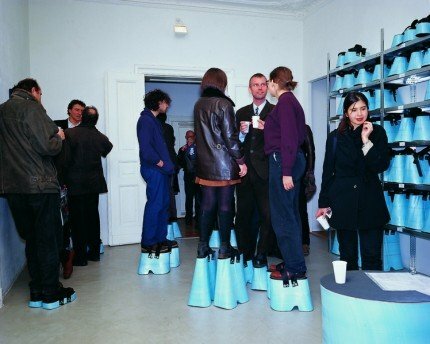 So during one of my no-shoes phases of the party I was chatting with a guy and he realized I was the same tall person he’d been talking to earlier. He said “wow, I take you a lot less seriously now.” It was ouch but also funny. This is something really weird, haha. The people are really inventive, never heard about this same-height party thing before, it’s really funny but also very weird and I don’t get the point of it.